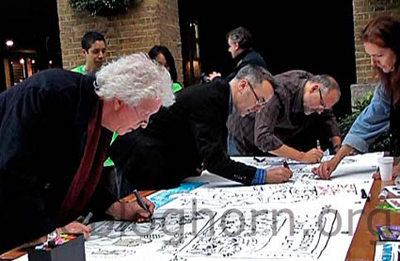 Well, the PCO/Foghorn magazine team put together a cracking banner for the Battle of the Cartoonists at the Big Draw on Saturday, but we were pipped at the post in the "cheer-o-meter" by Private Eye. I've written a full report on the day's fun and games over at the Bloghorn. 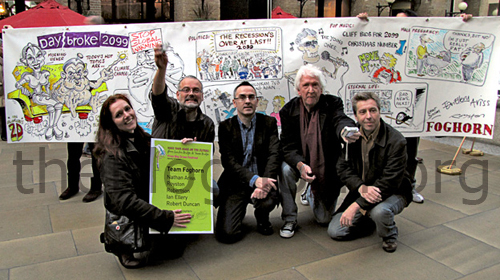 Pictured above, with the banner, are, left to right, Cathy Simpson, Ian Ellery, myself, Robert Duncan and Nathan Ariss. Thanks to Denis Dowland for the photos. Looks like everyone had a great time, Royston - shame I missed it. I'd been meaning to pop by but then realised I was double booked already! I'll try and make sure I finally attend the Big Draw next year. 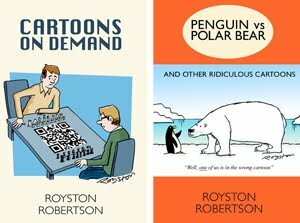 It's a great event Rob, it'd be good to see you there. 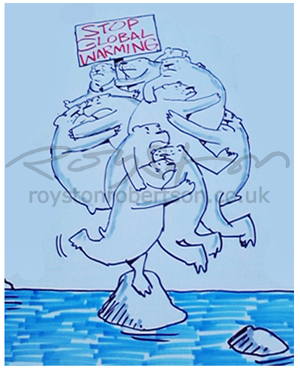 You'd be best raising the pictures question on the PCO forum, I didn't take many myself due to being busy drawing.